About Ilios Steryannis - TubThumpers - Be A Drummer. Born in Toronto, ON, on March 24th, 1972, Ilios Steryannis started drumming at the age of 12. Inspired by the artistry and power of Led Zeppelin drummer John Bonham, he pounded on a practice pad and an old set of bongo drums until his father lovingly presented him with a brand new Tama Royalstar drumset, with Paiste cymbals, for his 13th birthday. Since then, Ilios and the drums have been inseparable. the Oakwood Collegiate symphony orchestra. Later, Ilios earned a full scholarship to the Banff Centre for the Arts jazz program at age 18, studying with the great Marvin “Smitty” Smith, drummer for the Tonight Show. This was followed by receiving a partial scholarship to study at Boston’s prestigious Berklee College of Music, where Ilios’ teachers included jazz legends Joe Hunt and Ian Froman. Back home in Toronto, Ilios completed his Bachelor of Fine Arts (Hons) degree in Jazz Performance at York University, where his instructors included jazz drummer Barry Elmes and multi instrumentalist Don Thompson. It was then time to hit the road, as Ilios joined jazz guitarist (and fellow Banff and York alumnus) Tim Posgate, touring Canada three times between 1995-97, and recording the critically acclaimed album “Mit”, which featured saxophone great Jane Bunnett. Ilios then turned his attention to composing and performing with his own band, with a large repertoire of original eclectic jazz tunes they showcased at Toronto venues such as the Rex Jazz Bar and were featured in the Toronto Downtown Jazz Festival. years. Ilios then joined the Parks and Recreation department of the City of Toronto in from 2006-2017. He also taught at Musica Music School. Ilios currently maintains a steady roster of private students at his own Toronto Drum School. Ilios’ performing career has also flourished, averaging between 75-100 shows per year as a freelance artist. In 2017, Ilios performed with African jazz artist Waleed Abdulhamid, jazz bassist and vocalist Michael Lalonde and world/fusion band ZimZum, among many others. ​Ilios has recorded a full album of his own compositions with some of Canada's top jazz musicians. "Bethany Project" was released at the Burdock on January 11th, 2018. The album has received four star reviews from All About Jazz and Danish jazz critic Ivan Rod, and is now available on iTunes, Amazon, Apple Music and Spotify. 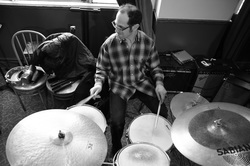 Ilios Steryannis is a highly respected session drummer in the Toronto music scene.